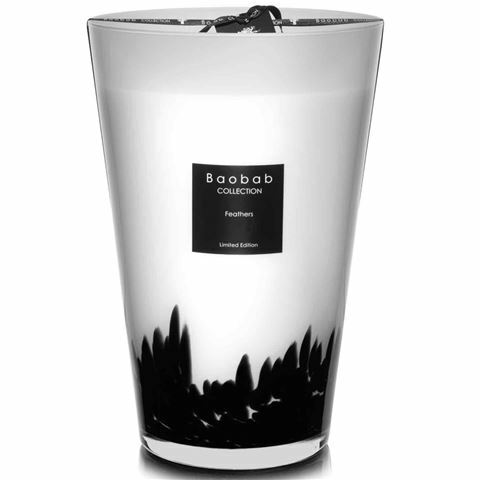 Exotic, luxurious and mysterious Baobab are some of the world's most highly sought after candles. You’ll understand why when you sniff the complexity of their fragrances, redolent of the richness of African' foliage with the refined style of their Belgium origins. Ever since 2002, the Baobab candles have been tantalising home fragrance devotees with their fresh, green overtones that were honed in the world’s fragrance garden, Grasse in France. Black feathers dance across the opalescent glass in a blend of alternating transparency and opacity with this Feathers Maxi Max candle with an astonishing 800 hours of burn time. The Feathers candle is at the same time masculine and feminine, yin and yang, thanks to its black rose and oud wood scent.. Enter a world of fragrance with Baobab Candles. Estimated burning time of 800 hours.